One of the holiest days in Hinduism, Diwali celebrates the victory of good over evil and is cause for the biggest celebration in Indian culture. As the Sanskrit word Diwali literally translates to “festival of light”, celebrations across India (and, increasingly, the world) feature candlelight processions, fireworks, gatherings and food. 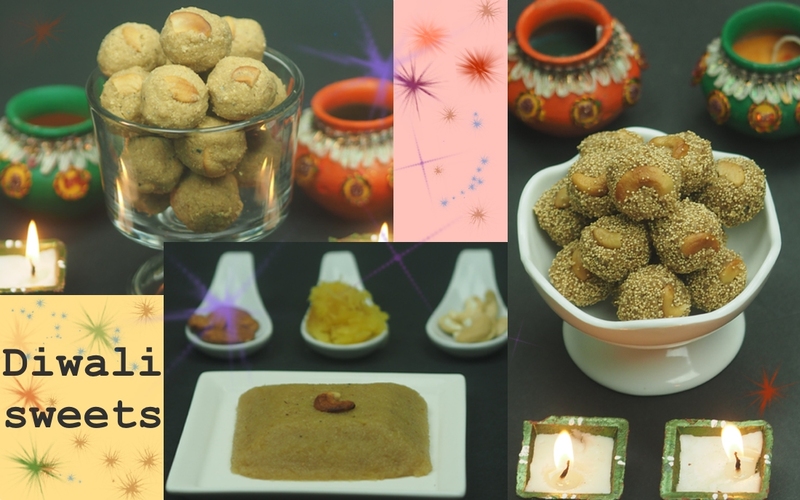 I’ll be posting one recipe per day throughout the Diwali season to help you celebrate in delicious style. Whether you’ve come to my Indian cooking blog merely out of cultural curiosity or as a source for your next family meal, you’ll find nothing but the best Indian recipes. Crunchy, tasty and healthy Amaranth, coconut laddu here. Flax, poppy-seeds, coconut laddu here. Dalia, poppy-seed and coconut laddu here. 5 ingredients and 10 minutes laddu here. Sesame seeds, almond laddu here. Sesame seeds, bengal gram lentils flour laddu here. Semolina laddu with palm sugar here. Low-carb and low-sugar creamy, smooth and aromatic Rava kesari recipe here. Another Low-carb and low-sugar variation of kheer here. Enjoy most out of pumpkins this season with this healthy bakshalu/poli here. Keep looking for more. Don’t forget to like and comment if you like them.